After a long break in website updates, here are some of the new additions. We have new visitors seating area, Machan for a birds eye view and those interested in heights. Our farmhouse and visitors area has been renovated. Mig & Max from France spent 3 weeks in June interning at the farm. It was a great experience for everybody. They learnt some of the sustainable practices and we got inspired to try again paddy in natural farming methods (seedball method). The rains this monsoon has been satisfactory. Vegetables has almost stopped. Hopefully should start again in a month or so. Mangoes this summer was not great, but we got close to 10 varieties. The fruits have been pretty regular. Scanty rainfall have not helped us much this time. Let alone Paddy, even Ragi and other Millets plans did not materialize. We have planted only Avarekai, Urad and Alasandhe. On the positive note we harvested Sesame (Til). Extracted appx. 10 kgs of oil and gustily being consumed daily at home for past few months. We got our own coffee of 1 kg...which was a good start. Microsprinkler technique seems to be doing pretty well for our vegetable crops. Somanna with his wife Gowri joins us at Vanashree. Fire set up by miscreants in the neighbourhood entered the farm and destroyed almost quarter acre patch. About 70 Arecanut, 70 Coffee, 130 Banana and Cardamom plants were destroyed in the rage which lasted all but 30 minutes. Shanmukha and family were just mute spectators for the raging fire. Long awaited event of an elephant coming inside the farm did happen at last. It did leave tell tale signs of its visit. It was not one but 5 of them. Clearly shows how much we have encroached into their territory. We were very fortunate to Shri. S.G Neginhal (retd. IFS) in person and get a personally signed copy of " Forest Trees of the Western Ghats". Its a must have for anybody remotely interested in Trees of India. To get your own copy, you may contact him at sgneginhal@gmail.com .The forests of Karnataka owe a lot to his dedicated efforts over last 50 years in conservation and ensuring their existence. Installed couple of Pheromone fly traps from Pest Control of India (PCI) to control fruit fly damages to Pumpkin and Chow Chow and the trap seems to be working pretty well. On my recent visit to US, got 2 tools to make our work easie at the farm. The first was Earthway Precision Seeder, an amazing and must have for all small farmers. We could sow Ragi, Paddy, Beans, Radish, Soya Beans, Maize etc…in less than 10% of the time and effort. The best thing about this stroller like seeder is the only energy required is your muscle power, no diesel, no petrol no battery. It cost me $90 (appx. Rs.4000) on Amazon. The other new tool is Mantis Minitiller, which cost appx. $350. Though it is very handy, the tines wore very early and have to wait to get another one from US. Each tine costs $65. Posted on 9th Sep2011: Students from Washington State University on a day visit. 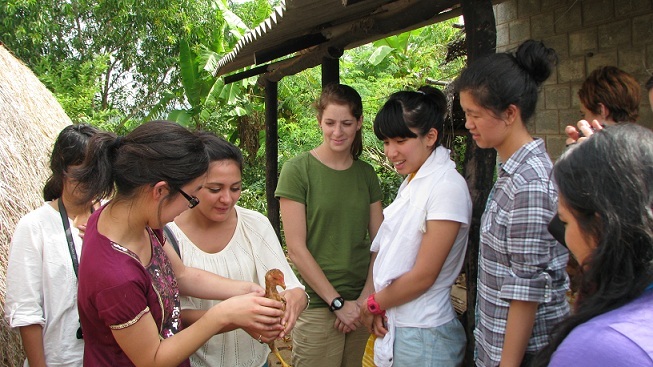 25 students from Washington State University, Seattle spent a day at the farm as part of their 4 week program in India understanding importance of bio-diversity and conservation. Apologies for not updating this section regularly. Going forward will try my best to update this once 4-6 weeks. Monsoon is around the corner. We are targeting planting 600-700 saplings of various trees, seedball making for Tur, Paddy in the coming weeks. Any volunteer help (digging pits, planting, cutting etc.) is welcome in June/July for tree planting. This summer, we had many visitors ...from families interested in getting their children introduced to farm life, serious farmers, alternative lifestyle explorers to NGOs getting children as part of eco awareness trips. Sapna & Harsha from LIFE were with the children on 23rd April. Bhargavi Rao from ESG with children. Mangoes, Water Apples, Guavas were harvested for the time. Pineapple should be ready for harvesting in couple of weeks. It was that time of the year when Shanmukha and family went to their native place for their annual vacation for 2 weeks. So it was my turn to tend to farm 24x7 during that time. Birdlife has been very impressive. We have had a couple of sparrows exploring the nook and corner for nesting for last couple of days. Peacock calls are regularly heard. Brahminy starling, Crested Cuckoo, Drongos, Black Shouldered Kite, Goldfronted Chloropsis and varieties of Bulbuls have become regular residents. We are now a IMO certified "Organic Farm" through group certification efforts of Sahaja Samrudha. 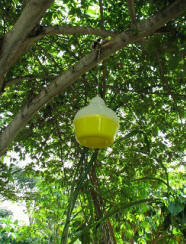 We harvested honey in Dec '10. Will be harvesting again probably by end of this month. Sad to say that 2 out of the 4 boxes were lost due to pest attack. Wild elephants have been frequent visitors in the vicinity for the last 4-5 months. Last week we had a herd 50 mts from our farm. So far they have not ventured into our land. Apparently this the 1st time in last 10 years elephants have ventured so close to the village. Continuing to supply fruits and vegetables to Lumeire (organic restaurant) and Ojas (organic outlet near Bangalore. Our Bananas and Papayas continue to be in good demand. Continuous stream visitors continue and it has been a great pleasure interacting with all of them. It has been heartening to see many people committing themselves to nature. Combination of work and literally being 'powerless' at the farm for almost 10 weeks resulted in delay in updates. we got power after almost 10 weeks of waiting. Gobar gas plant is back in shape and generating enough gas for us to cook. Thanks to the inputs from Kempu Reddy from SKG sangha and couple of days of hard labour by Shanmukha to get the plant going again. Shreesh Ponkshe from Pune and Pradeep Kuttuva from Bangalore volunteered to help me take care of the farm for 2 weeks when Shanmukha and his family went to their native place for their annual vacation. 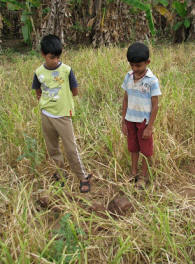 Sriram and Manoj planted Chick Pea (Avare Kai) for about quarter of an acre. As always we have neither tilled nor weeded the land. Paddy also has been tried in "Fukuoka Method". Agriculture department had organized a visit of about 30 farmers from the taluks of Bidadi, Harohalli, Magadi and Kanakapura to understand the sustainable farming practices at Vanashree. Paddy planted in SRI method is doing reasonably Ok. The variety used this time has been "Chinna Ponni". You can see that Paddy doing Ok despite no standing water (actually the top soil is completely dry). We have been watering this paddy twice a week. Our Gobar gas plant has been misbehaving for past couple of months. Have been trying various things to get it going. Keeping our fingers crossed with our latest experiments get it going again. Durga (Malenadu Gidda) gave birth to a beautiful female calf last week. We are yet to decide on the name. We harvested honey (about 4 kgs) for the first time and it was a wonderful experience. One particular bee was not too happy about us stealing its honey and its sting was not too painful. The new entrant into our tools, brush cutter is being used extensively to cut all the tall grass. The cut grass is left untouched and this acts as mulch to the entire area. Thanks to Shanmukha's relentless efforts and inputs from our friend Shashi, drip irrigation for all the plants (appx.6 acres & 2500 plants) is complete. The total cost of the project was around Rs.30,000. Thanks to Shashi, we now have 2 well established Honey Bee boxes in the farm. This adds a critical element in our efforts to strive towards integrated farming. About 130 children from BNM Primary School (Class 1 to 4) visited Vanashree. The children were exposed farming & food crops, alternate energy, rainwater harvesting, interaction with farm animals, trees & bird identification as part of the education trip. Unsuccessfully tried growing wheat in Fukuoka method. But failed completely probably due to poor choice of seeds. need to wait for Oct 2010 for renewed experimentation. Paddy sown in Fukuoka method has completely failed. The summer crop of paddy which was cut near the base is doing pretty well. They are about 1-2 ft tall with about 15-25 tillers. Groundnut was harvested and more than 90% was eaten up by mice...didn't even get the quantity that was sown. Stopping grazing of the land by Cows had a dramatic impact on the land. The left photo was taken in May'09 and the right one in Aug'09. Implementation of drip irrigation has started with right earnest. Thanks to inputs from our friend Shashi and Shanmukha's hardwork, we have been making pretty good progress in installation. Hopefully Shanmukha and I should be completing the installation by end of the month. 'Gowri' our hallikar cow has given birth to a male calf "Nandi"
Horsegram, Tur, Groundnut planted in Fukuoka method is doing extremely well. Alasandhe is being harvested. Though the rains have played truant, we have finished planting almost 1000 saplings of 30+ species till date during this monsoon. Total saplings across the farm is now around 3500 covering 125+ species. Its early days to comment on paddy sown in "Fukuoka method". The new seeds broadcasted are in various stages of germination. However, summer crop of Paddy after being cut near the base has come up impressively. Will update with photos in a weeks time. Planning underway for drip irrigation. Lakshmi, our Malenadu gidda cow gave birth to a female calf "Nandini". So far we have completed planting about 450 tree saplings covering 25 species. Another 1000 more to be planted in next 6 weeks. 170 banana suckers have been planted. We got the suckers from our plants. Horse gram, Alasandhe, Moong & Tur which were broadcasted (natural farming method for the 3rd consecutive year) have all sprouted and the recent rains have also helped immensely. Groundnut has also been sown, albeit in a modified natural method. Groundnut seeds were sown in a small furrow (1-2 cms) made by hand and the seeds were covered by soil. 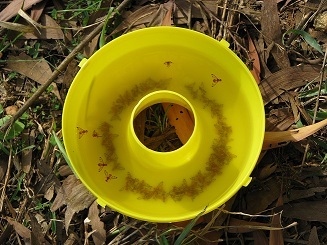 This method was adopted to prevent seeds being eaten by birds and field mice. All the seeds have sprouted. I had to take 9 days off from work to be at the farm covering for Shanmukha. Shanmukha was on his half yearly visit to his native place. I made most of the time available and good rains we got to finish most of the sowing and digging pits for the tree planting during monsoon. Monsoon '09 target for tree planting - 1500. Till date ~ 200 planted. With the onset of pre-monsoon showers it was time for some serious activity. Horse gram and Ragi was sown by Natural method (Fukuoka Method). About 6-7 kgs of Horse gram and Ragi was mixed and broadcasted over 6 acres of land in appx. 3 hours. The land was neither tilled nor de-weeded. This is the 3rd year in succession that we have sown Horse gram in this manner and 1st time trying out Ragi. Horse gram have sprouted and already showing couple of leaves. Tur was sown in a slightly different manner. Again no tilling or de-weeding, but made a small scoop in the soil and dropped a seed. All those seeds which got covered by soil have sprouted but those which did not, got eaten by mice and worms. Nevertheless, the growth in SRI method is phenomenal with almost 50-70 tillers and stands at almost 4 ft tall, Aerobic method - 25-40 tillers at appx. 2.5ft tall, Natural method at 15-20 tillers at appx. 2-2.5ft tall. Vanashree was the venue for an enthusiastic group of 45 BSc Agriculture students and their Professor Dr. Sharanappa, on Sat, 25th April. The field trip was part of GKVK, final year BSc students to experience the organic, natural & integrated farming methods. Homeschoolers group of Bangalore congregated on 19th April with their kids to discuss about shared HS elements. The kids had a good time. Some trekking to a nearby forest, some playing in the water and some getting to know the animals. All the kids planted native Brinjal seedlings in a pot to remember their visit to the farm. Rice grown in SRI method seems to be doing much better than the other two methods i.e "Aerobic" and "Fukuoka" methods. Tillers in SRI method ranges from 40-55 per seedling so far. The photo shows one with 53 tillers. Tillers in Aerobic method is around 15-20 and that in Fukuoka method is around 5-10. Aerobic method has been completely mulched with waste grass and hay to minimize irrigation. In Fukuoka method it is intercropped with green gram. Indian Laburnum or "Golden Showers" is in full bloom and certainly justifies the reason for being in the list of 10 most beautiful Indian trees. Our enthusiasm to mulch for everything without paying much attention has taught an important lesson. All our vegetable beds were mulched with waste Ragi straw, but we have realized that ragi remaining in the straw have sprouted and not allowed the vegetable seeds to sprout/germinate. Lesson learnt : Don't use ragi straw for mulching vegetables if the straw has remnants of ragi in the stalk. Our Yelakki Banana yield continues to be strong and we have been regularly supplying at Jaivik Krishik Society. Average yield per bunch has been around 7-8 kgs. One particular bunch weighed in at 13kgs. Not bad for a plantation that gets minimal water once a week and no de-weeding for last 15 months. "Kuteera", our Gazebo is now almost complete. Very proud of the fact that the construction was completely done by Shanmukha, Nagaraja and me without any external labour. 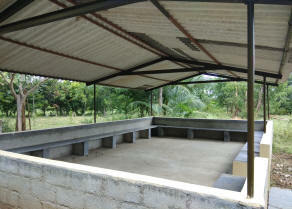 It did take some toil but heartening to see our efforts taking a shape and well..shelter too. Rice in all 3 methods (Aerobic, Fukuoka, SRI) seeming to be doing well, with growth being best in SRI method. Wheat heads have made their appearance. Not sure about the yield, but we are happy to see them grow for the first time. Have tried 3 different methods of growing rice - SRI, Modified SRI (Aerobic) & Fukuoko method (Natural farming). Construction of "Gazebo" that can accommodate about 40-50 people is underway. Our "Tur" and "Cow Pea" failed completely this time. Not sure about the reason. Planting of wheat seedling in about 600 sft of land completed. Started supplying bananas to Jaivik Krishik Society in Lal Bagh. Will be trying out paddy in SRI method. Paddy being tried this time is "Salem Sanna"
All varieties of paddy (appx. 500-550 kgs) has been harvested. Will be trying out wheat for the first time as summer crop for a small area. Preparation for growing paddy (summer crop) will start in next few weeks. We had to send 3 male calves of Malenadu Gidda (Ganesha, Krishna and Subbu) back to Ashram. We got one female malenadu gidda calf "Sharada". 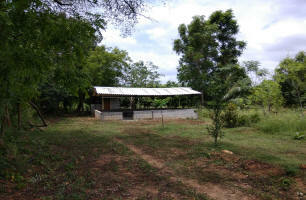 We started constructing a hut that can accommodate about 35-40 people. Recently introduced 2 Guinea Fowl chicks. 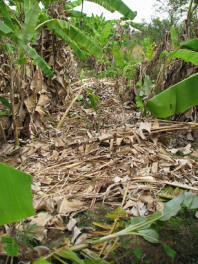 Planted about 100 coffee saplings between Banana plants. Mulching done in preparation of the summer. Glad to say we have many visitors from Bangalore over weekends with similar interests in nature and farming. Durga (Malenadu Gidda breed) gave birth to a male calf "Vishnu"
Paddy "Chinna Ponni" variety has been harvested. Were able to get 60kgs of Rice (about 80-85 kgs of paddy) from 1500 sq. ft of land. Introduced "Common Carp" (150 nos.) and "Grass Carp" (50 nos.) fish into the rainwater tank. Ganga (Hallikar breed) gave birth to a male calf "Shivu"
Have completed planting 3 different varieties of Paddy (Bili Nellu-Red Rice, Chinna Ponni-White Rice, Sona - White Rice). Ragi & Varieties of Dal (Tur, Green, Black, Cow Pea, Chick Pea, Horse gram and Alasandhe) have also been planted. Planning to Harvest "Til" once the rains stop! Banana plants have just started to flower. Groundnuts should be ready for harvest in 4-6 weeks. Also planted about 200 seedlings of various trees during the rains.